California became the 15th state to adopt an official state grass when Governor Arnold Schwarzenegger signed Senate Bill No. 1226 into law on August 23, 2004. By no means an overnight success story, proponents of purple needlegrass had been engaged in several years of advocacy, education, and supporter recruitment for the idea. In fact, the California-Pacific Section of the Society for Range Management had passed a resolution in the mid-seventies to designate purple needlegrass as the State grass. The most recent efforts were lead by Frank Maurer, Executive Director of the Quail Ridge Wilderness Conservancy (QRWC), in Davis, California. The Reserve, overlooking Lake Berryessa in Napa County, is one of the few nearly unscathed natural areas left in the California Coast Ranges and its 2,000 acres serve as one of 35 reserves in the state designated as a natural reserve of the University of California. An impressive array of organizations was amassed to support Mr. Maurer's efforts by the time the legislation was proposed. In an October, 2003 meeting of the Board of Directors of the California-Pacific Section of the Society for Range Management at Hunewell Guest Ranch in Bridgeport, members requested that Edie Jacobson compose a resolution or letter of support for the purple needlegrass and forward it to Mr. Maurer at the Quail Ridge Wilderness Conservancy. At that time, the California Native Grass Association (CNGA) and the California Native Plant Society (CNPS) were behind the effort as well. This native perennial grass is a signature species for our state, since it is the most extensive and widespread native grass in California, with a range extending from the California-Oregon border to Baja California. It is a beautiful, hardy and long-lived plant (individual plants live up to 100+ years). Its seed was one of several used by many California Native Americans as a food source. During the period of Mexican ownership of California and the huge cowhide and tallow industry developed by the Mexicans, the grasses of the Central Valley, including Nassella pulchra, were the basis of cattle grazing and subsistence. It is an important food source for many animal species. The deep root systems (6-15 feet) of the grass support the survival of oak seedlings, especially in warmer areas of the state, by maintaining moisture in the soil for the seedlings and by promoting the growth of mychorrhizal fungi, which are important to the health of oaks. As a hardy, drought-resistant plant, Purple Needlegrass is very well suited for xeric (dry) landscapes and for restoration projects. Once established it aids greatly in suppressing the growth and spread of non-native invasive weeds, such as the well-nigh ubiquitous and noxious yellow star thistle. A state grass serves as both a symbol of and a tool for teaching about the natural environment of early California. State Senator Mike Machado introduced, and read for the fist time, Senate Bill No. 1226, as sponsored by the Quail Ridge Wilderness Conservancy, in the California State Senate on February 11, 2004. Co-authors were Assembly members Patricia Wiggins and Lois Wolk. It is the state's best known native bunchgrass (perennial grass which grows in bunches) occurring over the full length of California. It is hardy, drought-tolerant, and long-lived, as well as a food source for wildlife. It is an important part of California's history and has been used for restoration projects and erosion control. It is critical to recognize this native plant as a precious resource and enhance grassland heritage throughout the state. The author's office and proponents note that "purple needlegrass" has informally held status as the official state grass since the mid 70's when the Society for Range Management passed a resolution to designate it as the State Grass. This measure would formally designate Nassella pulchra (purple needlegrass) as the official California State Grass. Proponents emphasize that purple needlegrass has been in California for hundreds of years - it adds rich color along state highways, nurture's oak trees, repels the invasion of weeds, helps conserve the state's dwindling water supply, provides a food source for grazing animals and other wildlife, burns slowly, and is very useful for restoration and revegetation projects. As of May 5, 2004, the following organizations had registered official support for the measure to adopt purple needlegrass as California's official state grass. Hundreds of letters of encouragement were received as well from private citizens throughout the state. On May 10, 2004, Senate Bill No. 1226 was passed unanimously in the Senate and passed to the General Assembly. With no opposition, the legislation passed through the General Assembly by early August and was sent to Governor Schwarzenegger for his signature on August 12. The following information was excerpted from the California Government Code , Title 1, Division 2, Chapter 2. 425.10. Purple needlegrass, or Nassella pulchra, is the official State Grass. Source: California State Legislature:California Law, Government Code, , February 15, 2008. Source: USDA, NRCS. 2008. The PLANTS Database, 15 February 2008). National Plant Data Center, Baton Rouge, LA 70874-4490 USA. Source: Society for Range Management:California-Pacific Section, Secretary's Minutes & Policy Changes, , February 14, 2008. Source: San Francisico Chronicle, Managing Nature, , February 14, 2008. Source: Quail Ridge Wilderness Conservancy:News, Purple needlegrass is now California's official state grass, , February 14, 2008. Nassella pulchra (Hitchc.) 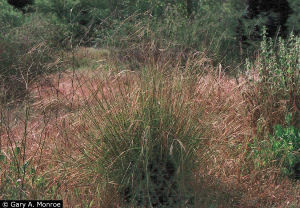 Barkworth, Purple needlegrass: United States Department of Agriculture: Entry in the Natural Resources Conservation Service's PLANTS Database. Nassela pulchra, Purple needlegrass: The Theodore Payne Foundation for Wild Flowers and Native Plants. CalPhotos Photo Database: Photographs, from various sources, of Nassella pulchra. CalPhotos is a project of the Biodiversity Sciences Technology group (BSCIT), part of the Berkeley Natural History Museums at the University of California, Berkeley. Some native and naturalized grasses: John Rawlings blog entry: purple needlegrass, Nassella pulchra, Mar�June, Native. Jasper Ridge Biological Preserve, Stanford University. Nassella: From Wikipedia, the free encyclopedia. Nassella pulchra: Integrated Taxonomic Information System Standard Report Page: Nassella pulchra. State Grasses: Complete list of official state grasses from NETSTATE.COM. Manual of the Grasses of the United States Vol. 2 : Volume 2 of the basic study of American grasses, both indigenous and escapes, cultivated and wild. Dover Publications.